Earlier this morning, a co-worker handed me the Personal Journal section of last Tuesday's Wall Street Journal. The photo above took almost a third of the page. The article, "Who Quits Before Race Day?" focused the topic of training for a marathon around the recent NYC Marathon. In addition to the interesting testimonials and medical commentary, the article reaffirmed a strong belief that I have often shared regarding our ability to finish strong, as long as we get to the starting line. The key is to train carefully, follow the plan and taper properly. In short, make it to race day, and you will finish! 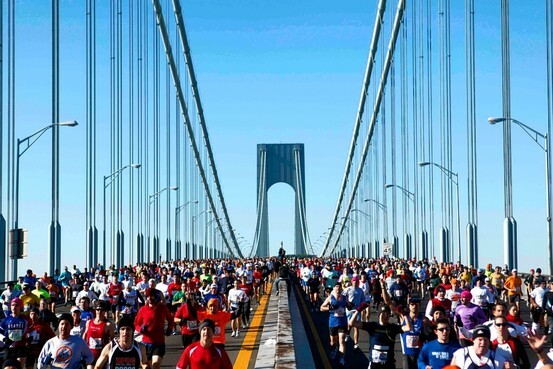 Consider the Data: For NY, over 60,000 runners signed up, but only 45,000 made the official start. Approximately 25% of those that said, "I want to run NY", never got the chance. Yet, of those that showed up on race day, somewhere between 96-97% received a finisher's medal. Those are pretty good odds in anyone's book. The article goes on to say that an average marathon experiences an 80% start rate (20% drop out rate) from those officially entered. I thought this was pretty interesting that large events would actually be that much larger if everyone showed up! The race organizers have enough history to know where to cap the field, staff the volunteers, procure the aid station supplies, etc., by balancing the drop out rate.